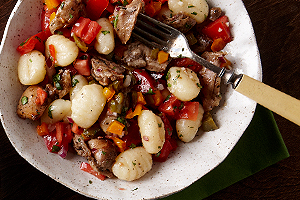 The fusion of Jamaican jerk and Italian gnocchi creates a new-world comfort food with warm aromatic spices and rich flavors. Position a rack in the center of the oven and heat the oven to 450 degrees F.
Combine 2 Tbs. of the olive oil, 2 Tbs. of the lime juice, the jerk rub, and ½ tsp. salt in a shallow bowl. Toss the chicken with the oil mixture to coat completely. Place the chicken and chopped peppers on a rimmed baking sheet, keeping them separate, each using half of the baking pan. Drizzle the peppers with 1 tsp. of the olive oil, and toss well. Roast 20 to 25 minutes, until the chicken thighs are cooked through and the peppers are crisp in spots. To make the lime juice vinaigrette, in a small bowl, whisk together 4 Tbs. of the olive oil, 3 Tbs. of lime juice, the red onion, garlic, ½ tsp. salt, and 1¼ tsp. pepper. Reserve. Meanwhile, bring a large pot of well-salted water to a boil. Cook the gnocchi according to package directions. Drain and transfer to a large bowl. Toss the gnocchi with the lime juice vinaigrette. Add the chicken, peppers, and tomatoes. Season to taste with salt, sprinkle the cilantro over the top, and serve.